What we wouldn't give to be a stitch on that shirt. It's the off-season for college football fans, a long dark tea-time of the soul. Many ardent aficionados while away the long cruel months between January and September assembling various all-time teams, dredging up YouTube clips of their favorite slobber-knocking hits and breathtaking runs, or drawing up depth charts before there has even be a single snap of spring ball. Over at the UT Longhorns site Hornfans.com, though, there's another hobby — finding new ways of expressing fanatical mancrushes on Vince Young. Some do it by endlessly vilifying the Houston Texans. Others do it by putting a picture of VY in their sig. 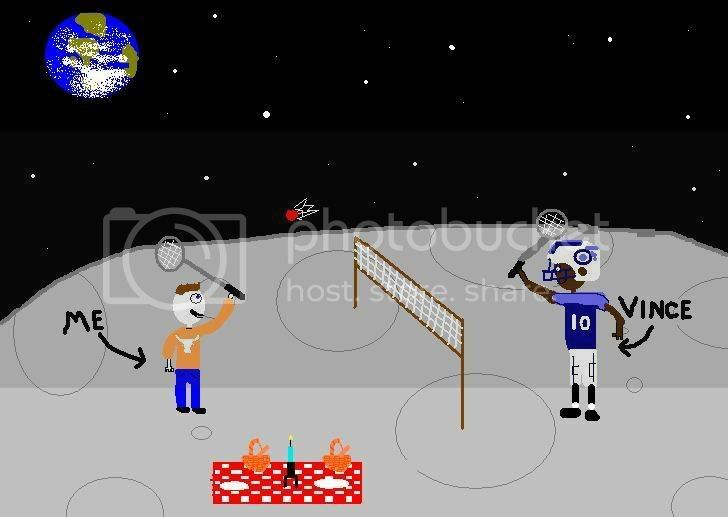 But no one has ever been bold enough to top poster "Theo Huxtable" and his MS Paint masterpiece: Brokeback Badminton on the Moon.